Are you looking for beautiful chain earrings? look no further! In our jewelry webshop you can find stylish chain earrings. These hip earrings are characterized by the long chain that hangs on the earrings. We have cool chain earrings in the colors silver and gold. With nice charms such as an star. Combine the chain earrings with other lovely jewelry from Aphrodite. For example with a nice layered necklace. The layered necklaces from Aphrodite are very popular and will fit perfectly with your chain earrings. These double necklaces come in 2, 3, 4 or more layers. Whether you like silver or gold jewelry, at Aphrodite you will find beautiful jewelry that will complete your outfit. As a woman you naturally need basic clothing, and the same goes for jewelry and accessories. The layered necklaces are easy to style and should certainly not be missing in your jewelry box. The great thing about the layered chain necklace is that you can wear it to any occasion. You can also create your own layered necklace by wearing minimalist necklaces and long necklaces together. With beautiful jewelry your outfit looks more interesting! You can style your chain earrings in different ways, for example with nice bracelets. We have both silver and gold chain bracelets. That will fit perfectly with your chain earrings. In summer and spring it is always nice to add a little more color to your outfit. You can do that best with the colorful bracelets from Aphrodite. Do you prefer that your jewelry does not stand out too much? then it is best to combine your chain earrings with fine bracelets. Or mix and match them all together for an arm party. Do you have no idea how to make your own arm party? please take a look at our category bracelets sets. We have bracelets sets with 2, 3, 4, 5 or several nice bracelets. Getting trendy jewelry is of course fun! but giving it is just as fun. We have beautiful quote bracelet with texts that are perfect to give as a gift. Are you looking for a special gift for your girlfriend? then you should definitely choose the BFF necklace. This way everyone knows that you are inseparable. Do you always want to look on-trend? then you need initial jewelry. They are very popular at the moment! We have bracelets, rings and necklaces with letters. They will fit perfectly with your chain earrings. Your hands also deserve to be decorated. We have statement large rings with beautiful natural stones that will give your outfit a boost. But also minimalist rings that are not very striking but still look very nice. Do you want a mix between statement and subtle? then the rings set from Aphrodite that you are looking for. Our ring sets will be perfect in combination with chain earrings. The ring sets consists of 3, 4, 5 or more rings. We even have a 15 piece ring set! Do you not want to wear jewelry other than your new chain earrings? then complete your look with the right fashion accessories. The scrunchies are very hot at the moment. You can put it on when you wear your hair in bun or tail. These stylish chain earrings are a real must-have that should not be missing in your jewelry box. 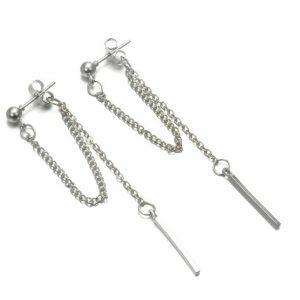 These beautiful chain earrings have a silver chain and a delicate bar pendant. Do you have 2, 3 or more ear holes? then combine these earrings with other lovely earrings for an ear party! Complete your look with a silver layer necklace. Or with a nice subtle ring. Do you have questions about these silver chain earrings? please send us a message. 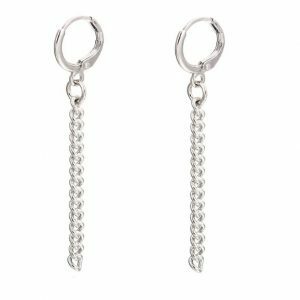 With these chain earrings you can easily give your outfit a cool touch! A silver chain hangs on these chain earrings. Do you have 2, 3 or more ear holes? then combine them with other cool earrings for an ear party! Complete your look with a stylish link bracelet or with minimalist rings. Must have earrings for the fashionista! 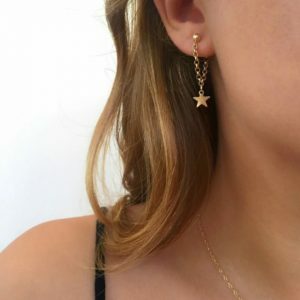 These gold chain earrings have a small star pendant. Do you have 2, 3 or more ear holes? then wear several nice earrings together for an earparty! Combine these chain earrings with a layered necklace with star and moon pendant. Or with a beautiful minimalist ring or fine bracelet. Do you have questions about these chain earrings? please send us a message.